You are here: Home / SEO / Article Writing / Article Builder Review – Is The LifeTime Offer Worth The Investment? 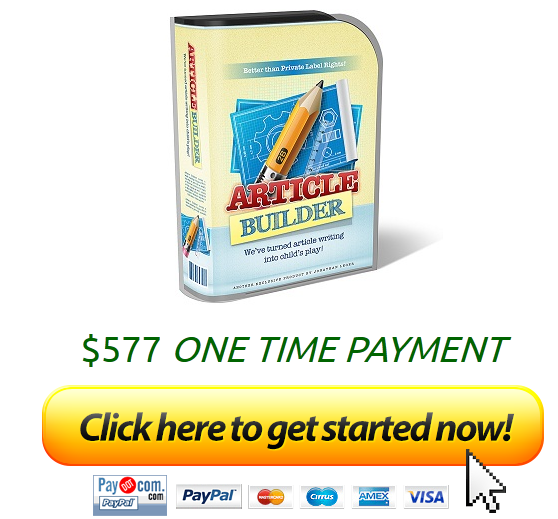 Article Builder Review – Is The LifeTime Offer Worth The Investment? The tool released as Article Builder is known to quickly produce content for your website or web 2.0 properties. It is not meant to SPAM these sites, but rather help with the content creation and save you time to work on other projects. What this tool does is take Private Label Rights (PLR) articles and break them down into snippets. The snippets are used to create a unique article based on the category selected. Article Builder claims to have tens of thousands of these categorized snippets in the database ready to generate a unique article every time. The only main downside of Article Builder is the amount of categories they support for article creation. This can really limit your article creation if your industry or niche is not located. This list below contains all the current topics that Article Builder can create instantaneously. The tool is allowing users to suggest new categories to be included and they are working hard to expand the database to include these new niches. A way around this is to get an article written and then go to Microsoft Work and do a find a replace. Replace the topic covered with the topic you need. Then read through the article to make sure it sounds good and make any necessary grammatical changes. This also helps to increase the articles uniqueness and avoid being picked up by Google as duplicate content. As stated by Article Builder “even if a topic you need isn’t yet covered, if enough users request that topic we WILL add content covering the topic. Thousands of new snippets get added to the database EVERY WEEK based on what is requested by our users.” so this ensures that this list will continue to expand to meet users needs. There are many benefits and downsides of using Article Builder. For starters using Article Builder can save you hundreds even thousands of hours of tedious article research and writing. The tool does all of this for you in a matter of seconds, not hours! The downside is the content is not always top quality. This can result in SPAM, which is not what we want especially with all the new Google animals out (Penguin & Panda Updates). Spinning content is another feature available, but I do not suggest using this as it can result in duplicate content and is unethical SEO. The articles pass through CopyScape and other duplicate content checking tools, but it is not always readable for humans. This means you need to go in and proof-read the article and make any necessary changes or updates to make it flow smoothly. This also helps increase the articles uniqueness. We do not want to SPAM all the social networking sites, article websites, web 2.0 properties, etc. We want to provide quality content that will rank in the search engines. These pages can contain backlinks to your website with your anchor text to help you move up the SERP’s. This is the way Article Builder is meant to be used. You can generate as many articles as you need fro the same topic and run them through CopyScape to ensure the articles are not duplicated in anyway. Articles are always over 80% unique, pretty impressive! This offer expires November 30th, 2012 for the lifetime license so take advantage now. By the way, PayPal is offering a “bill me later” option that gives the customer 6 months to pay for the purchase with no interest.